This fascinating and well-stocked museum is housed in the upper level of the Larnaca Castle on the city's seafront. The castle itself is the main attraction, built in 1625 by the Turks to defend the city from invasion. There is still a Turkish inscription above the doorway. Later it was used as a prison during the early years of British rule. One of the most popular attractions in Larnaca, the castle also operates as the Larnaca Municipal Cultural Centre during the summer and hosts local cultural events. 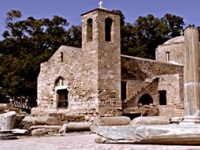 The museum contains displays from the early Christian, Byzantine, Lusignan, and Ottoman periods. Opening times: Monday to Sunday. 8am to 5pm, September 16 to April 15. April 16 to September 15, 8am to 7.30pm. Closed on public holidays.